If you are starting in the CNC and lathe industry and are just getting started with your new machinery, take some time to learn all about how to operate the machinery. Lathes can be intimidating because there are a lot of working parts that need to be set correctly. It is wise to study guides and do a lot of practice cuts before starting on real work or something important. The article below is Part 1 of 2 on using a new lathe. Part 2 will be coming later this week. Give them a read! Now you have your lathe setup, and all the tooling to get started. What’s next? Getting it going and doing something with it! I take a very slow cautious approach with any new machine tool. It’s just who I am. I’m usually super eager to make stuff with it, but I’ve found that being over-anxious and jumping into things too quickly, typically leads to extra expense, which, after spending this much money on a machine, is the LAST thing you want. I know I’ve said this in a past article, but, I’m going to say it again. Use conversational programming to write your programs? Use a CAM program to generate your gcode programs? Whichever method you decide to use, make sure you understand the gcode that your system generates. Reading thru the coding section of your manual will never hurt you in the least. If you’ve never taken the time to learn g-code, try CNCCookbook’s Free G-Code Tutorial–it can help you a lot! Me personally, I use a combination of option #3 then option #1 as I like to do all my programming with CAM, then after I’ve tested that program, I optimize the gcode by hand. I can’t really talk on using conversational, as that’s something I have done very little of, so I’m not even going to profess any knowledge of it to pass on to you. I personally use SprutCam, but there is a plethora of other CAM programs out there to choose from. The most important thing about CAM is the ability to find, build or have built a PostProcessor for your lathe. The Automate FL300-II that I use has a Siemens 808D Basic control on it which is a fairly popular control, especially in Europe. It’s also becoming a lot more prevalent here in the USA. You want that customized Post Processor because while gcode is meant to be standard, it is anything but. 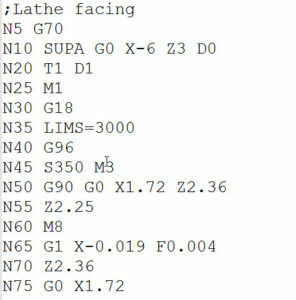 Pretty much every control maker out there has customized gcode in some fashion, and the post processor needs to be able to post into the format your particular control understands. Use the simulator on your lathe. Most modern controls have some sort of simulator which allows your control to pretend to execute the program, without the potential of causing damage. I used it a lot when I want first setting up my machine and getting the post processor working. Another thing to think about, is that some control makers offer a PC Based simulator that you can download to “test” your code on the same computer you use to write your code. I know Siemens has a PC Based simulator to download. Using the simulator is invaluable in testing out and vetting a new post processor for your machine. You can also use CNCCookbook’s G-Code Editor to simulate g-code. Plus it has all sorts of features that make it easier to understand what the g-code is doing, such as hints for each line of g-code in plain English. Sure, it’s exciting to see the machine whipping around at 1000 inches per minute, but think about it…. How fast are your reactions?? Mine are pretty quick, but at 1000ipm, there’s no way I can hit stop or pause in time to prevent a crash in the event I screwed up (which, let’s face it, with a new machine, it’s inevitable). For all new programs, I dial my rapids down to 200 ipm. It’s slow, but gives you plenty of time to keep catastrophe from happening. Continue reading Part 2 in our blog post coming later this week!